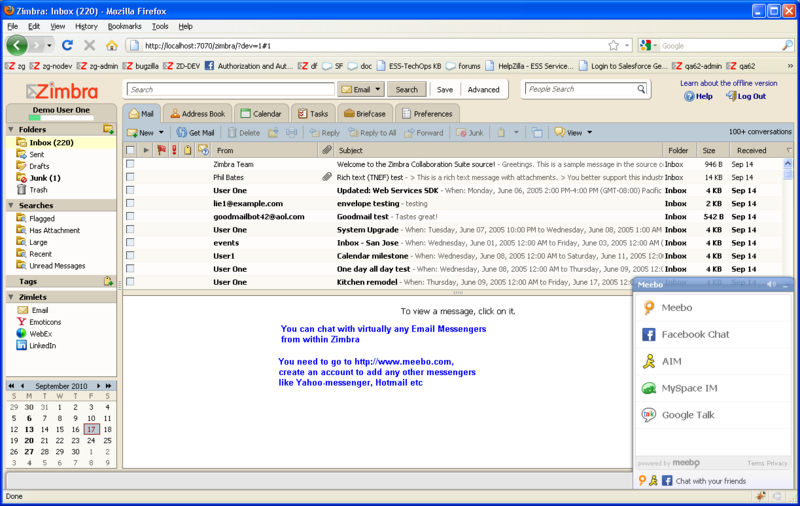 With Meebo Zimlet, you can chat with your friends on Yahoo!, GTalk, Facebook, Hotmail, AOL etc popular messengers right from within Zimbra. If your messenger is not shown by-default, you can add them by creating a Meebo account. Then add all services that are not turned-on by default. Version 0.8 uses newer version of Meebo code to load the bar. Meebo purchased and shuttered by Google on June 6th, 2013. This Zimlet should likely be removed from the gallery.Meebo is no more. Since Meebo has discontinued it's messeger product with it's acquisition by Google, this add-on will not work. Please remove the add-on or mark it as obsolete.See Meebo Discontinued Products and Google is acquiring Meebo! Seeing that meebo is soon no longer operating are there plans ( or even options ) to update this plugin? i like this zimlet, but i would love it even more if it was updated. 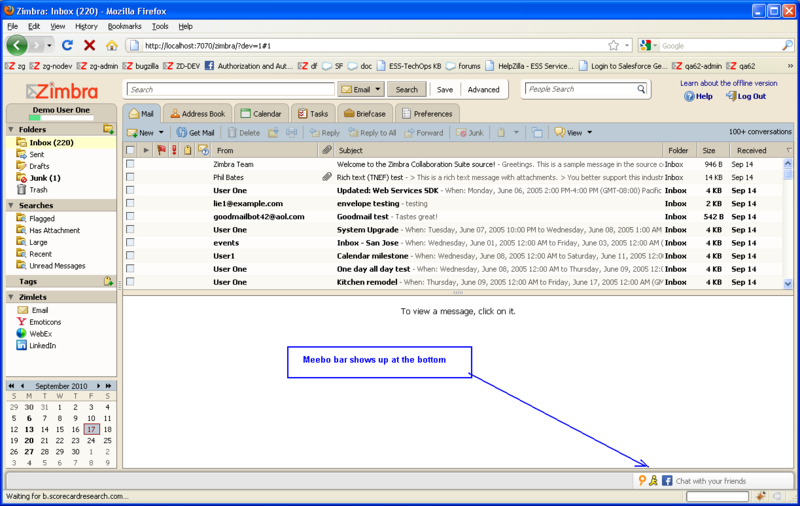 You can now access Meebo right from Zimbra! Meebo integrates your social communications into a single interface. 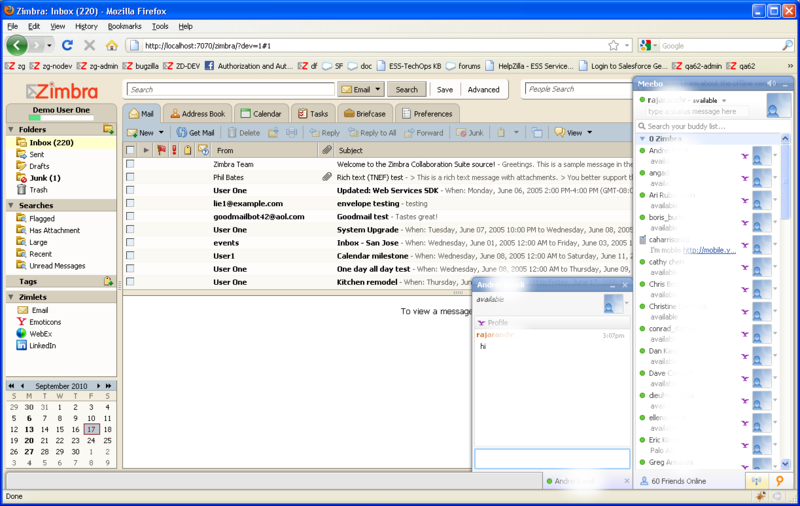 And this Zimlet displays the Meebo control bar in Zimbra making it easy to access your social network anytime from anywhere.